No doubt you’ve seen and heard of the amazing benefits of pet therapy with both young and old. With little effort, I’m sure you can call to mind therapy dogs and cats that have made countless lives a little brighter. But let me throw you a bit of a curve; how many of us have seen hens~(Yes, I’m referring to chickens) as a viable option for life enrichment? In the UK, a project called HenPower, now in over 40 senior communities, seeks to combat loneliness and promote enhanced well-being through hen-keeping. Piloted in 2012, the program has been wildly successful. The people who participate in the program call themselves “Hensioners” and take great pride and joy in raising the chickens and taking them to visit others. It has given many of these seniors new purpose and a renewed connection to one another as they care for these feathered creatures. It has even had an effect upon those with dementia, with noted decreases in agitation and a reduction in the use of anti-psychotic drugs. On the other side of the pond, Pacifica Senior Living Mission Villa Memory Care has also been having some pretty great results with their very own glamor hens: Hilda, Gilda, Tilda, and Winnie. Two of the “girls” are Rhode Island Reds, and the other two consist of a Black Autralorp and an Araucana. Community Relations Director Lynda Sparrow, the self- proclaimed “hen whisperer” was the original owner of the hens. She related that it has been a blessing to see them successfully assimilate into the daily workings of their memory care community. 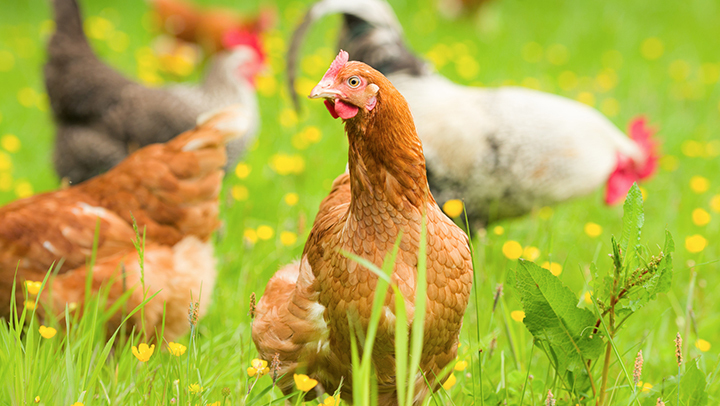 She shared that in one instance a resident who never spoke began carrying on a conversation with her about the hens and now engages in discussions with both Lynda and her Executive Director beyond just the chickens. I hope I’ve piqued your interest just a little bit with regard to the connection these feathered beauties can have with seniors. I’ll leave you with a few pictures of the “ladies” from Mission Villa Memory Care and call to action for all of us to look beyond just cats and dogs to see the potential benefits in these fine feathered friends. For more information on our Mission Villa Memory Care community please contact us today! This entry was posted in Alzheimer's and Memory Care, Health and Wellness, Lifestyle, News and tagged #henwhisper, #pacificaseniorliving on March 10, 2016 by Pacifica Senior Living.